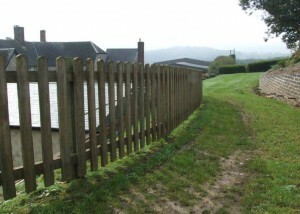 Pale Fencing and Panels - Blamphayne Sawmills Ltd. The Pale Panel is ideal for marking boundaries without obstructing light and visibility. It is a pre-assembled fence panel constructed with vertical square-edge pale boards . This panel is a durable and stable fence panel, despite its open slatted palisade design. The timber has also been Pressure Treated to provide a guarantee against rot and fungal decay for up to 15 years.